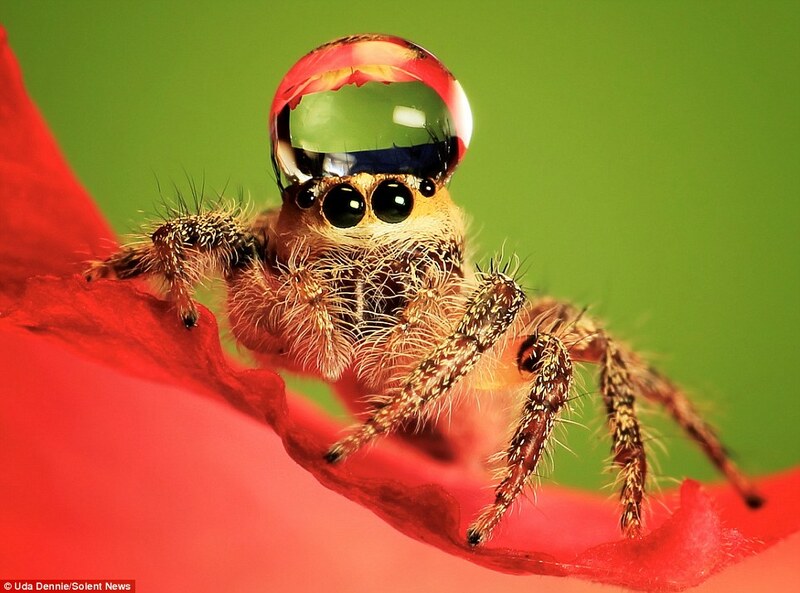 A spider with a water droplet hat! A huntsman is about 100x this size. But look at his cute little face. So, I was talking with an American friend recently and teasing her about spiders. Here in Australia, the spiders are numerous, dangerous, or just plain big and scary. My friend visited Oz and I had to chase a huntsman spider out of my house when she was there. It was easily as big as my hand and galloping all over the walls and floor. I sent my friend a package, and the teasing happened while the package was in transit. So, of course, I told her that I may have sent her some live cargo, completely accidentally, because you just never know where those sneaky little buggers might be. And, thanks to the wonders of international postal transit, they’ll probably have time to have a couple of generations before it finally arrives (it didn’t take that long to get there, luckily!). Poor little box-spiders, travelling to the promised land. It inspired me to write her a little story. It’s the first thing I’ve written in months! She gave me permission to share it with you all, so here it is, in all its silly, spiderly glory. Some fun facts and love for the glorious huntsman! It was another dark day, and the Huntsman and his family were making the best of it. The nest was doing well: much silk had been spun and it was almost ready for the next batch of eggs. The Huntsman’s grandchildren would be laid soon, and hatched a little after that. He wasn’t sure if he would be there to see the new ones crawl out; it was hard to mark the passage of time in this dark journey of theirs, but he suspected that his season was coming to its end. “Wife, have the children had their learning today?” he asked, settling himself down, legs curled close. “Oh, eat your head, husband,” his mate replied. She was busy with the hole in the corner of their small parcel of the world. It was a tiny hole, too small to crawl out of, but with a little coaxing, prey would sometimes make its way inside. The Huntsman shook his head and cleaned his face patiently. The children returned from their forays for prey, most with empty silk-sacks. It was slim times inside their parcel; the Huntsman wasn’t sure how long they could survive. It had always been this way for them, though, since the angel visited and told them about their destiny. There had been much light, and many bright words, and then the enfolding dark. Storms raged outside the walls of their home, shook them sometimes, but never broke inside. He was safe here with his family. Protected. The angel had done as she had promised. But pickings were slim. The Huntsman closed his eyes. It was quiet today, the storms outside barely a rumble. The temperature was dropping, but there was plenty of insulation and softness to keep him and his family warm inside their little boxed home. He listened to the voices of his children, reciting their learnings. They were on a journey to a goddess in a golden place, the tale went. There, prey would run to greet them, foolishly sacrificing themselves. They wouldn’t have to live in a small parcel of world: they would have huge boxes to run around in, all bright and interconnected, with delicious shadows and comfortable nooks to settle in, low planes to gallop over, tall surfaces to scale and skitter across. Prey would be so plentiful that they would have only to reach out and grab it, so they would only run to enjoy themselves, to feel the different textures under their many feet, and perhaps to chase down a wayward mate. The goddess would be grateful for them, for the Huntsman’s prey have caused her much distress. He and his family will come and deal with the vermin, and she will be grateful, and they will live happily together. “And how will we greet the goddess, when the time comes?” the Huntsman’s wife asked. The Huntsman cracked an eye open to watch. The children raised their front legs in polite salute, then dropped down and rushed towards their mother, up and over her, around and back and forth, giggling with delight. They stamped as they went, their little feet tapping out their love all over their target. Two of the children untangled themselves from the heap they had landed in and crouched apologetically. “Why does the goddess need us to hunt for her?” another child asked. “Because she has only four legs,” the Huntman’s wife said wisely. The children murmured with surprise and dismay. “But father still has all of his legs,” another child protested. The children looked at each other, shuffling their feet as they digested that, as if it was prey they hadn’t quite killed properly. Wriggling all the way down. “When will the goddess take him away?” one of the littler ones asked finally. “I’m not curling yet,” the Huntsman said finally, cutting off the conversation. He scowled at the children, then turned around to listen to the wall beside him. Tiny scratches would mean that prey was near, but the wall was still and quiet. He hungered. The children continued to chatter about the goddess and her angel. Wondering how long their journey through the dark would be, how many storms and shakings they would have to go through. How many tests they would have to endure. When their sisters would get fat with eggs and if their children would be born in the dark, or under the goddess’s light. What it would be like to be able to run, free of the confines of their parcel of the world. His wife hesitated, then turned to the children. “Eat up, now.” She didn’t hunger either, it seemed. Their season was almost done, but the children, they were healthy. The nest was almost ready for them. One way or another, the Huntsman would see the goddess soon, and curl himself around her blessed sky. His children or grandchildren would hunt for her and keep her happy, and they would live in plenty and splendour, galloping in the golden place. He was content with that.